SINGAPORE COMICS & COLLECTIBLES: PUNISHER Vol. 10 #1 (2014) Marvel Now! PUNISHER Vol. 10 #1 (2014) Marvel Now! 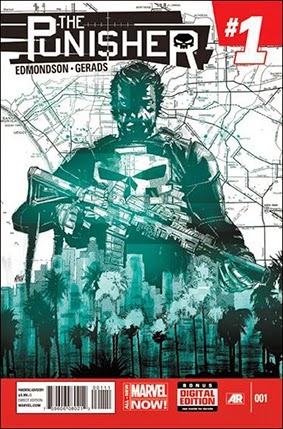 • PLOT SUMMARY: For years, The Punisher has waged a war on crime in New York City with an array of very large guns, but a lead on a major source of drugs, weapons, and more has set his many sights due west. NOW! Frank Castle's in the City of Angels, looking to give the devil his due. Things aren't all they appear, though, with a highly trained military hit squad hot on Frank's tail. Caught between a posse of Punisher predators and targets of his own one-man-war, Frank's manifest destiny may be a shallow grave! (CA) Mitch Gerads. (W) Nathan Edmondson. (A) Mitch Gerads.